Located between the sea and Rhône, the Domaine de la Palisade, belonging to the Conservatoire du Littoral, lies outside the dams, making it particularly interesting ecologically, with specific fauna and a flora. It is the last natural area testifying to the natural evolution of the Rhône delta. The Domaine de la Palisade, located between Salin-de-Giraud and the coast, stretches over 702 hectares on the right bank of the Rhône. 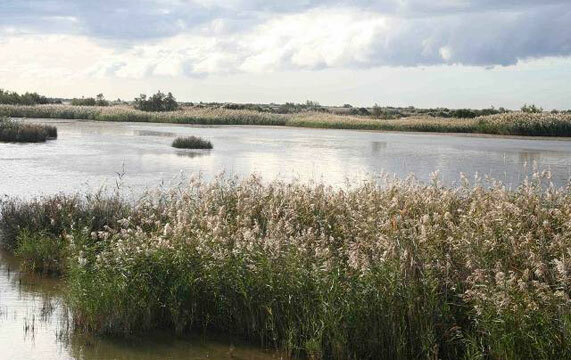 It lies entirely outside the dams that protect the low Camargue from the inflow of river or sea water, making it particularly interesting ecologically, with specific fauna and flora. It is the last natural area that testifies to the natural evolution of the delta. Formerly the estate was exclusively used for breeding, fishing and hunting. The Conservatoire du Littoral bought it in 1976. The estate can be visited along its foot-paths and on horseback. It includes a nature exhibition and a picnic area surrounded by trees.